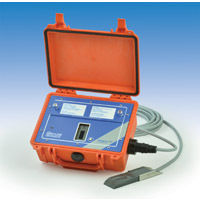 The portable Stingray 2.0 is a compact, battery-powered area-velocity flow logger. It data logs level, velocity and water temperature readings for flow monitoring through open channels, partially full sewer pipe and surcharged pipe. It can be used for flow surveys, inflow and infiltration studies, storm water, irrigation water and sewage.